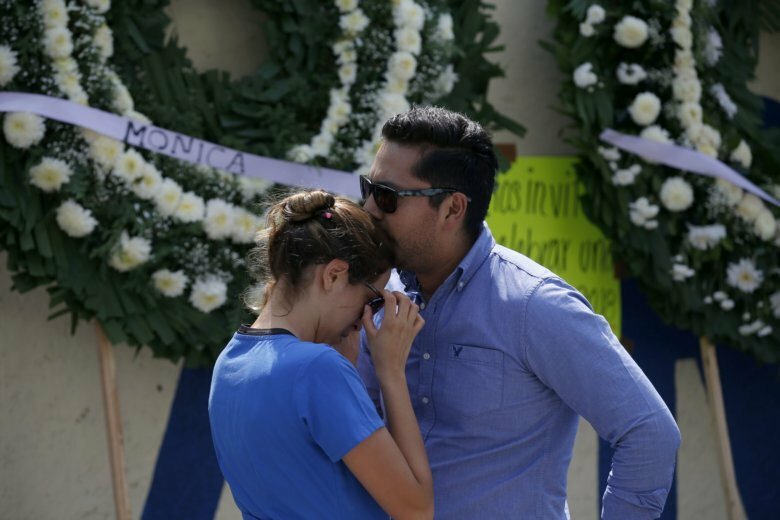 MEXICO CITY (AP) — Mexico’s wounds remained open Wednesday as victims, relatives and rescuers marked the Sept. 19 anniversaries of last year’s earthquake that killed more than 360 people and the devastating 1985 temblor that left at least 9,500 dead. With reconstruction slow from the 2017 quake, relatives of the dead and quake victims gathered at vacant lots where buildings once stood. A year later, their search for justice has been fruitless, with none of the owners or builders of collapsed structures having been convicted. Fernando Sanchez Lira stood on the lot where both his mother and sister died when a five-story downtown office building collapsed in last year’s magnitude 7.1 quake killing at least 15 people. Overall, the temblor killed 228 people in the capital and 141 more in nearby states. Sanchez Lira said the building had been unsafe since another tremor 12 days earlier. He said authorities allowed a heavy cellphone tower to be built on the roof years ago that may have contributed to the collapse. Moments later, the quake alarm siren sounded mournfully during an anniversary drill. Mourners held their arms aloft in a signal that was used by rescuers after the quake to call for silence and has since become a symbol of remembrance and solidarity. A weeping Arturo Gomez, his arm aloft, shouted, “We miss you a lot!” He referred to Maria Elena Sanchez Lira, his wife of 39 years and the sister of Fernando Sanchez Lira who died in the quake. Elsewhere, victims’ relatives gathered at the site of a seven-story office building in Mexico City’s Condesa district that collapsed last Sept. 19, killing 49 people. The rubble was long ago cleared, but the site remains blocked off with plywood. Friends and family of victims have posted signs with messages of love on the fencing. “It’s difficult. All the memories come flooding back of everything. I can’t find words,” said Consuelo de Luna, whose son died in the collapse. Acosta recalled her cousin as a lover of concerts who took care of her. The building on Alvaro Obregon Avenue had been deemed unsafe well before the quake, so much so that a government agency was warned not to rent space there in 1997. Its deficiencies were never corrected, and other prospective tenants were never informed. Many rescuers who responded to the emergency that day attended Wednesday’s commemorations in their hard hats and other gear. Javier Martin Serrano, who collects and sells scrap metal and lives as a squatter a block away, returned to the site of a collapsed five-story office and factory. He had on the same threadbare pants and green nylon safety vest he wore when he went into the rubble that day to save a trapped woman. “More than anything today I feel melancholy, helplessness for not having been able to save more people,” he said. Like many other poor people in Mexico City, Serrano lives as a squatter in a building that authorities want to kick him out of. He and many others will have to live in precarious conditions, vulnerable to the next quake, until authorities build more low-income housing in the city. As if to underscore that pressing need, city riot police fought a violent skirmish with squatters armed with stones, sticks and gasoline bombs. The clash came in an effort to evict them from the ruins of a building damaged in the 1985 quake. Like many other buildings, it has stood in ruins for decades and was taken over by street vendors at least 20 years ago. Early Wednesday morning, President Enrique Pena Nieto presided over the raising of a huge Mexican flag to mark the anniversary of the shattering magnitude 8.0 quake of 1985.